Bidwell Park at your front door! 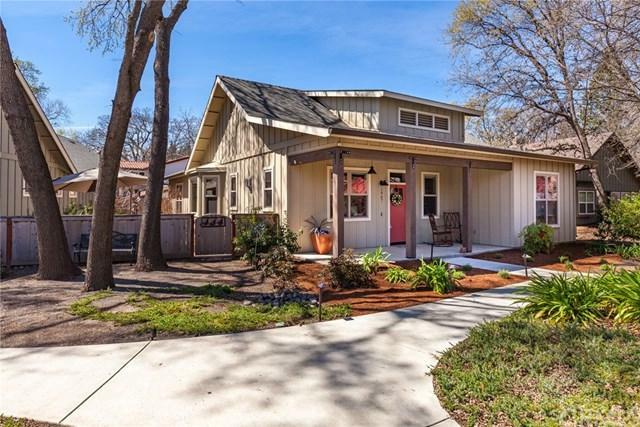 Located across the street from Chico Creek Nature Center and a stones throw away from Cedar Grove Entrance of Bidwell Park this Craftsman style home features an open concept living area. Through the charming pathway, you are led to the classic covered front porch which is perfect spot for a morning cup of coffee or just relaxing with a good book. Inside, you will find beautiful cherry engineered hardwood flooring, recessed lightening and the favored split floor plan. Perfectly appointed next to the living area is a well-equipped kitchen with quartz counters, high quality cabinetry, white subway tile backsplash, stainless appliances, gas range, breakfast bar/counter and a spacious dining area with a bay window overlooking the yard. The private master bedroom has a large walk in closet and offers an on suite-bath with a walk-in tiled shower and dual sinks. Other notable amenities include an office space with pocket door, a generously sized laundry room with a separate counter and sink, tile flooring, an oversized one car garage and much more! The fully landscaped courtyard offers a private setting which is a perfect place to unwind after a long day, plus a separate space perfect for a garden or storage. With Bidwell Park at your door step, this is a rare opportunity you won+GGt want to miss! Sold by Brandi Laffins of Re/Max Of Chico.